This organ was suggested by Paulo Ennes, who is a great Positief III fan. The organ is based on 16th century Italian organ of which an example with the same disposition can be found in the Silbernekapelle in Innsbruch, Austria. The Italian pipe organs have a number of very specific characteristics, which we have tried to capture in the Opus V. We have developed a brand new voice for this instrument to get as close as possible to the breathy and stringy sounding "Principale", for which the Italian organs are so famous. It has also got a "Voce Umana", which aims to imitate the human voice. In fact this is a 8' diapason like voice which has been slightly detuned to create a strong chorus effect. These voices were sometimes also referred to as Voce Celeste. This organ has a rare Decima Settima (XVII) 1 3/5' which provides an incredible rich sound, especially when the organ is tuned in the Mean Tone temperament. Also, this organ now features a brand new pipe distribution simulation (more authentic). The instrument has also got all the other usual bells and whistles you can find in the Positief III, such as a main volume, choice of temparaments, transposer, fine tuning, variable reverbration, simulated pipe placement (pan), etc. You can purchase the full version for only £35 by clicking the button below. Please visit our shop for collections of organ plugins and save money! 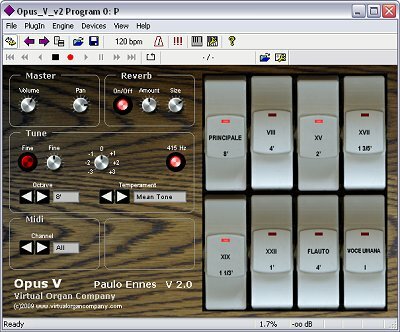 Complete set of software for this organ for stand alone use or use with Windows based VST host software. Terms and conditions apply.